Many moons ago, I worked in a nursing home kitchen as a dietary aide and I was there for 5 years, straight through the end of highschool and all of college. In those years of observing the cooks I picked up a few things. 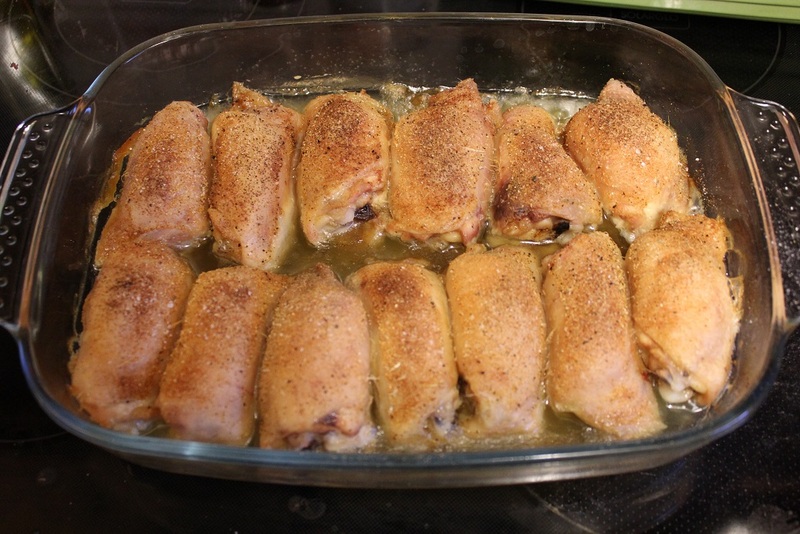 One of those things was how to make soft and delicious baked chicken. When I made it at home my auntie called it Stu Chicken. This dish takes almost no effort to prepare. The trick is to cook the chicken in close proximity, long and slow with the skins on. Below I’ve outlined the simple process which you can apply to any chicken parts which will yield the squishiest most delicious chicken you’ve ever had. 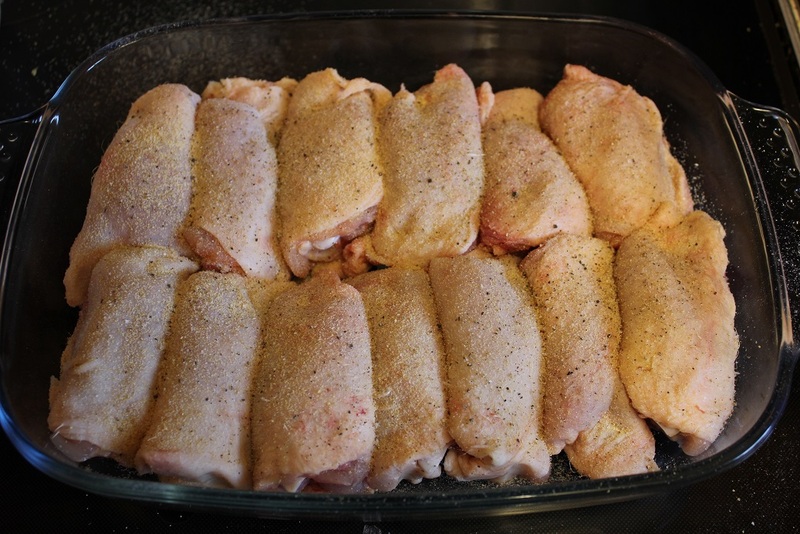 The first thing that you need to do is find a baking dish that you can squish all of the chicken into in a single layer. Unless you have a large family you’re probably going to be making more chicken than you have mouths to feed to fill your baking dish but the leftovers will reheat beautifully and they’re also very tasty cold, so it’s all good. Next fit them all in. You may have to be a bit creative with the positioning but just make sure they’re all touching. If there are gaps you’ll have dry spots and that means chewy chicken. Then sprinkle on the garlic, salt and pepper to your own personal preference. If you aren’t a fan of the spices I’ve recommended you can really put anything you like on there… Smothering it in a bottle of honey mustard dressing is also fairly amazing! Pop the chicken into a pre-heatd oven 160c/320f and bake for two hours. The chicken WILL be cooked in under two hours but that’s not the point. The point is that you want all the fat to come out of the skin and then the chicken is going to boil away in its own juices until the two hours are up and this is what’s going to make it fall off the bones. For those who indulge in the guilty pleasure of crispy chicken skin, you’re in for a real treat because the tops of the chicken pieces will be crispy and wonderful. If you are not someone who likes chicken skin, you’re also in luck because it pinches right off in one piece! 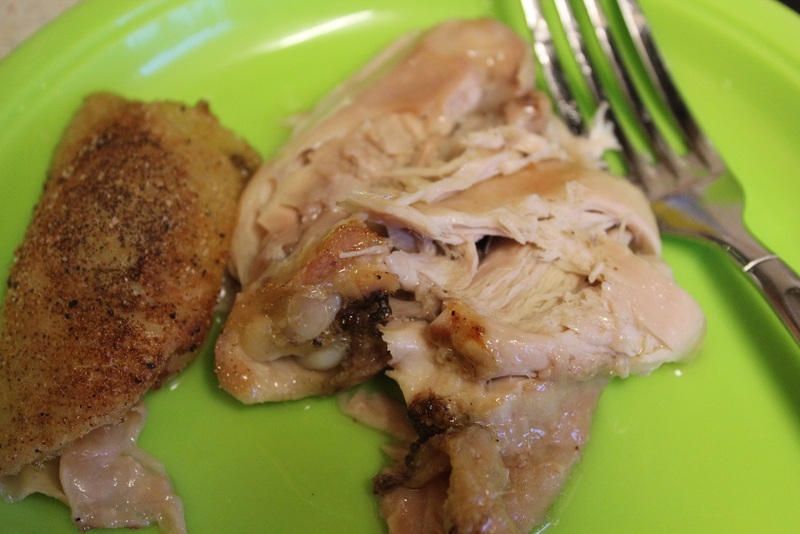 In the photo above all I did to the chicken thigh was remove the skin and then pushed the fork down on top and it squished apart with minimum pressure. The bone came straight away and it was absolutely delicious. This recipe works particularly well with dark meat but it can also work with chicken breasts, or a mixture of chicken parts. The most important thing is that you keep the skins on so that nothing dries out and that you cook long and slow. Loved this, thanks so much! 5 stars!!! Also! Do you recommend turning the chicken over and/or putting the spice on both sides before putting it in the oven? Hi! This was delicious! Can you tell me if the baking dish can be metal or if it should be pyrex? I have made this recipe just as you suggest and the results are yummy!! Thank you for sharing! Follow-Up: This chicken was excellent!! Probably the best baked chicken I’ve ever made (and I’ve made A LOT of chicken). Followed your directions exactly. Served with mashed potatoes and peas. 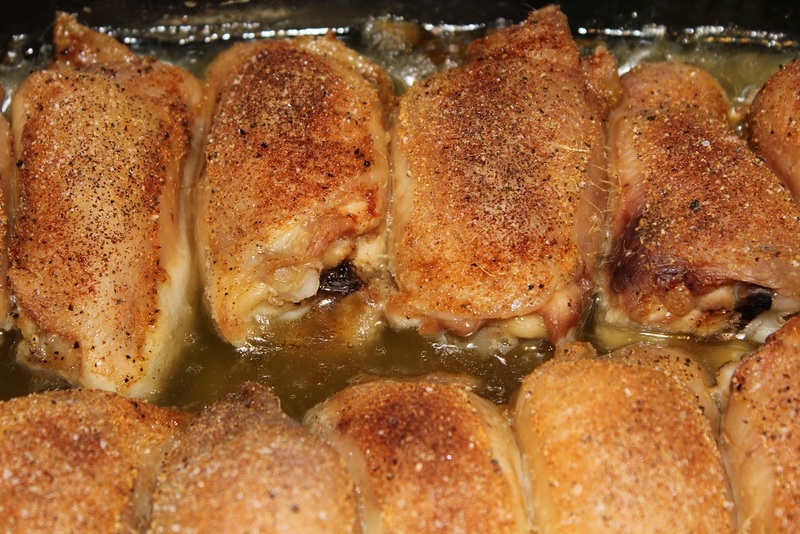 Will definitely be using this as my ‘go to’ baked chicken recipe. Thanks so much again for posting! You’re very welcome. So glad you like it! I’m making this tonight – looks delish. Do you you any olive oil to coat the chicken or not?? Thanks in advance! Nope, just dry spices and the fat from the skin will keep everything nice and moist… but feel free to experiment. :) Enjoy! Kudos to you for getting back to me so quickly!! I won’t use oil — can’t wait to make this – starting now!! Thanks SO much for posting this recipe and have a happy, healthy and gorgeous New Year!! I am trying this tonight with leg quarters . Wish me luck. This sounds really good. I am going to try it tonight with chicken legs. Thanks for sharing!